�The number of the dead has increased to 12 and 15 persons were injured. I can confirm that,� Malum said in a telephone interview with journalists on Saturday. Another eyewitness, Hasidu Abdulahi revealed that it took the effort of the Gombe and the Pantamin Police Division personnel to get water from a private water tanker to put out the fire of the truck as the Gombe Fire Service officials, who had gone to get more water, took too long in returning. Hasidu said, �We decided to use sand and water to fight the fire since help was far. �For over three hours, they found it difficult to put out the fire. They kept going back and forth. The reinforcement they called for took over 50 minutes to arrive.� he said. 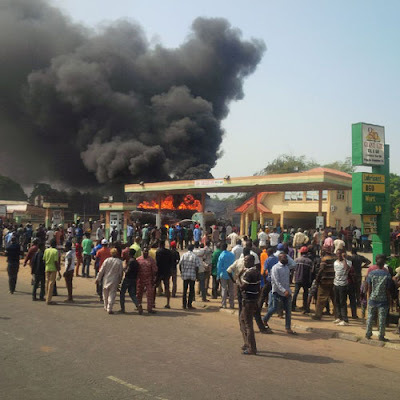 Speaking through the Speaker of the Gombe State House of Assembly, Mr. Nasiru Nono, the governor said, �The governor is pained by this gas accident, and has promised to bear the cost of the victims� medical bills. As a House, on Tuesday, we will extensively discuss the issues pertaining to another alternative bye pass as the growing population seems to have defeated its purpose.